Unlike 2-hole O-ring file keeper, our 3-hole O-ring file keeper is mainly designed to store frequently used 3-hole A4 size documents. This type of file holder is constructed of superior PP material, and has the advantages of attractive appearance, large capacity, good deformation resistance and ease of use. 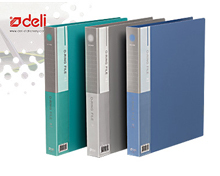 Deli Stationery is a file holder manufacturer based in China. Since our very beginning, we have been committed to providing customers with high quality office supplies. To achieve this, we constantly introduce the internationally advanced equipment and technology, and employ highly experienced staff to produce our file keeper, file box, PP file bag, etc. As a result, our products are high quality, and are sought after in the USA, Russia, Australia, Britain, Germany, Italy, France, to name a few. Please don't hesitate to contact if you are interested in any of our products.